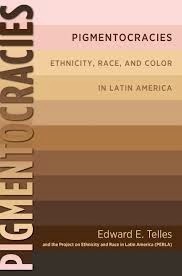 The research project on ethnicity and race in Latin America (PERLA) has published their findings in the new book Pigmentocracies. I haven't read it yet because of my teaching schedule, but am looking forward to it. The cover is a copy of the controversial skin color palette card their surveyors used across the continent. They used the palette rather than people's self-identifications because the terms for different skin colors vary widely across, and even within, countries. Interestingly though, the surveyor selected what color the respondent was, rather than allowing the respondent to choose (or including both selections in the study).